As a school-based SLP, I know I'm not alone in feeling like the public setting can sometimes be a burden getting in the way of my super awesome therapy... overflowing caseloads, mountains of paperwork, scheduling nightmares, lots of personalities - Oy! But even with all that going on, I've always known that being in the schools is a huge advantage. I get excited just thinking about it! That's why I'm writing this post on how to make the most of the school setting and start using it as your "edge" rather than that big ol' thorn in your side. A huge benefit of working in a school is the opportunity to see kids in a natural context, rather than stuck in an office for hour long appointments once or twice a week. Many of us share the same space with our clients, 7 hours a day, 5 days per week. And yet, most SLPs continue to see students in 20-30 minutes pull-out sessions, 1-2 times per week, regardless of disorder type/severity and despite a lack of evidence to suggest that is the most effective dosage or delivery model (Brandel & Loeb, 2011). That seems a little nuts, right?! We’ve been stuck in the medical model with our heads down and hands over our ears. And this is certainly not a new observation... A 1987 article in Communication Disorders Quarterly titled, "Out of the Broom Closet and Into the Classroom: The Emerging SLP," aimed to "address the changing role of the SLP by arguing that 1) as a profession we need to engage in better PR in the public schools and 2) we cannot expect to be employed by a school if we only provide limited services within a medical model" (Simon, p. 42). "I couldn’t understand that with Pinterest, TpT stores and school-based SLP blogs inspiring many of us to don our creative hats, that there was not more school based resources out there. I couldn’t help but think “Pirates are pretty cool…. but where do pirates fit into the curriculum?” Why do speech pathology materials constantly revolving around seasons and holidays such as Valentine’s Day, winter and St Patrick’s Day? We know that our students need repetition after repetition after repetition to cement their learning, so why are we introducing our own themes and topics with new vocabulary if it will not help our students succeed with the language and knowledge that they are learning in their classroom?" One of my ongoing personal goals has been to bring my school-based speech/language therapy in line with what's going on in the classroom. Some SLPs love this idea and others are very resistant to it. And let me tell you, I completely hear both sides! 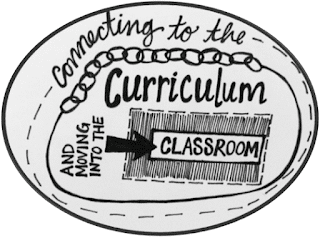 With 60+ students spread among 6 grade levels and 15 teachers, it feels nearly impossible to know what is going on in every classroom, much less feel prepared to use the curriculum in my therapy. Teresa Sadowski talks about the "common core pull" and the "push to push in" (as I've coined the issues) frequently on her blog, TheSchoolSpeechTherapist. My favorite article offers a frank commentary on the plug-in model: "Are You Really A Co-Teacher or Just A Glorified Aid?" I can’t tell you how many times I’ve been the glorified aide! On the flip side, I’ve also had plenty of opportunities to be successful working within the classroom and carrying curriculum over into my pull-out sessions. The Chapel Hill-Carrboro SLPs have made some great checklists for teachers that align with the standards. These are super useful for demonstrating education impact of speech and language impairments. Thank you to those brilliant SLPs to making these available for free! The ASHA Leader came out with a great article authored by heavy-hitters in the SLP research world - I like that the article opened with the big questions that folks in the field need answered (e.g., "Would it ever be appropriate to target the CCSS for chronically younger children?"). It could have offered some more practical solutions, but it is a great place to start and get yourself feeling pumped up. 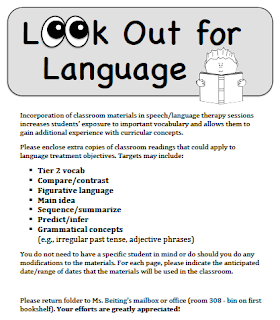 Get creative as you scout the curriculum for ways to tie in language therapy. 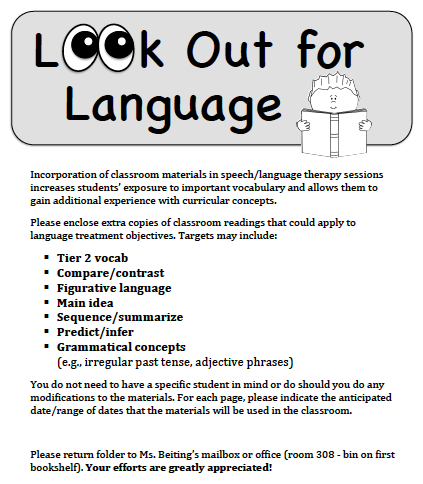 This year, I've put "Look Out For Language" folders for each grade in my mailbox, which is conveniently located next to the copier. The cover of the folder highlights a few language concepts that come up a lot in classwork. Some teachers don't use them at all, but other teachers have gotten in the habit of slipping articles and worksheets that may be relevant for language therapy in the folder. I love discovering the curriculum gems in the folders and thinking up ways to use them when I do pull students out! Three higher-level 4th grade language students: I made sure these guys got a teacher that I work well with and have co-taught successfully with before. Twice a week I come in during literacy circles and highlight a language skill within the small group, using the book they are reading as inspiration. The students love hearing the other teacher and I modeling our thinking to one another and they have started doing the same kind of thinking aloud within the group (e.g., SLP: I think I see an idiom in here. It’s funny but I don’t know exactly what it means... the passage doesn’t quite make sense when I read it. Teacher: Oh yeah, I noticed that too! Like why would cats and dogs really fall through the sky when it’s raining? SLP: Oh my gosh I know! So funny. I think “raining cats and dogs” must just be an expression that means “raining really hard”). We extend the conversation with a typical speech activity that you might do in pull-out (e.g., highlighting idioms in short paragraphs and then taking turns explaining what they mean using the context clues). As a result, their reading group takes a bit longer than it would if I wasn't in there, but the teacher knows the trade offs - The kids aren't being pulled as much, their language skills and academic skills are supported by using authentic context, and she gets a little bit of a break (at the very least, some interaction with another adult during the middle of the day). Two higher level 3rd pragmatics students: Again, these guys did great in the speech room but fell apart with problem solving in the classroom. Our school does tons of hands-on group work during science so that’s the time I chose to push-in for these students. I bring with me the problem solving mat I created as part of a TpT packet. If a problem arises, I can pull the student aside and talk through the size of the problem, help them consider multiple perspectives and practice verbalizing solutions. This “real-time” practice is great for our kids! We can also talk about real problems that other students might be having in the class - there are always verbal negotiations and quick perspective shifts that go on during group work. Our kids might miss the opportunity to learn from their peers without this adult-mediated experience. Four 1st grade articulation students: Daily 5 is a another great time to plug-in. I’ve become a “center” in some of the classrooms for my artic kids. I try to use what they are working on (e.g., forming sentences with spelling words that have artic targets) but I always bring some back-up materials if it looks like what they’re doing isn’t going to jive with the speech goals. Four 2nd grade students: I have found a lovely general ed teacher who welcomes my presence in her room. Once a week, I got in to do a whole group lesson. We chat briefly (often as we finding ourselves passing on the way to the microwave or bathroom!) about what is coming up in reading and relevant oral language concepts that we could highlight. One of my latest lessons was a hit with the whole class and really targeted the sentence expansion goals of my four speech and language students in her room. I used this genius powerpoint by Eve Coates with the whole group on the carpet, then used my own worksheet as seat work. I loved that the gen ed teacher and I took turns running through the slides and got to pop around to check in with the students as they worked independently. 3) Get out of your room and be friendly. That will lead to opportunities for collaboration! I hope it goes without saying, but building relationships with other staff members can only help you work more closely with them professionally. It doesn't matter how long or how successfully you've been collaborating, you need to read this whole article from the Indiana Resource Center for Autism. Ms. Vickers does a great job laying out practical advice for collaboration with staff, admin, and families. While you're at it, why not read some books that will help with more integrated and collaborative service delivery? My two favorites (I swear both are worthwhile) are Contextualized Language Intervention and Bringing Words to Life. Bringing Words to Life really helped me think about how to use read-aloud books (whether those from the classroom curriculum or ones I use independent of the curriculum) to build vocabulary. Best of all, it is super short and readable. Even before I finished, I had great ideas to bring into my pull-out and plug-in therapy. Contextualized Language Intervention is much longer and not as easy to get through, but I know it will be a great reference for many years to come. 4) Take it slow. You have to be realistic when trying to change your own practices and influence others to do the same. All the SLPs I know are super ambitious and full of energy, but can take it really hard when things don't go according to plan. Be willing to laugh at yourself, push your comfort zone, and expect changes to be gradual and bumpy. The best advice I can give is to find just one teacher you can work closer with. Build some rapport and then go from there! 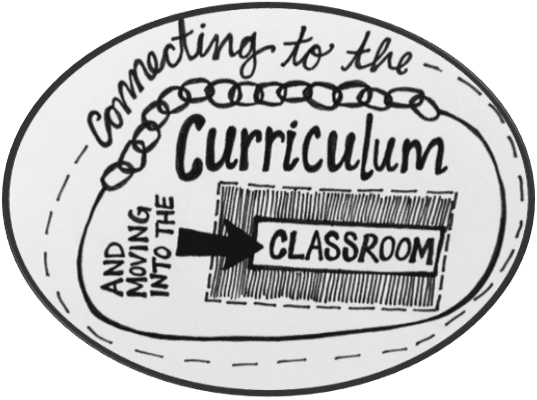 How are you using the curriculum in therapy? Have you tried "plugging in?" Share your thoughts in the comments! Beck, I.L., McKeown, M.G., & Kucan, L. (2002). Bringing words to life.New York, NY: The Guilford Press. Brandel, J., & Loeb, D. F. (2011). Program Intensity and Service Delivery Models in the Schools: SLP Survey Results. Language, Speech & Hearing Services In Schools, 42(4), 461-490. Clapsaddle, K. & Palafox, P. (2013). Make it work: Steps to save our sanity. The ASHA Leader, 18(8) p. 26-27. doi: 10.1044/leader.MIW.18082013.26. Simon, C.S. (1987). Out of the Broom Closet and Into the Classroom: The Emerging SLP. Communication Disorders Quarterly, 11, 41-66.